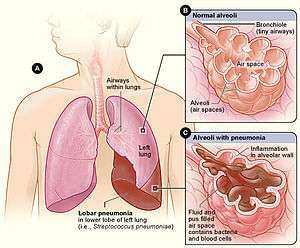 This article is about Lobar pneumonia. For the disease in general, see Pneumonia. For classification, see Classification of pneumonia. It is one of the two anatomic classifications of pneumonia (the other being bronchopneumonia). Micrograph of lobar pneumonia, H&E stain. Red hepatization or consolidation : Vascular congestion persists, with extravasation of red cells into alveolar spaces, along with increased numbers of neutrophils and fibrin. The filling of airspaces by the exudate leads to a gross appearance of solidification, or consolidation, of the alveolar parenchyma. This appearance has been likened to that of the liver, hence the term "hepatization". Grey hepatization : Red cells disintegrate, with persistence of the neutrophils and fibrin. The alveoli still appear consolidated, but grossly the color is paler and the cut surface is drier. Resolution (complete recovery):The exudate is digested by enzymatic activity, and cleared by macrophages or by cough mechanism. Enzymes produced by neutrophils will liquify exudates, and this will either be coughed up in sputum or be drained via lymph. The most common organisms which cause lobar pneumonia are Streptococcus pneumoniae, also called pneumococcus, Haemophilus influenzae and Moraxella catarrhalis. Mycobacterium tuberculosis, the tubercle bacillus, may also cause lobar pneumonia if pulmonary tuberculosis is not treated promptly. Sputum- for culture, AAFBS and gram stain. Blood for full hemogram/complete blood count, ESR and other acute phase reactants. The identification of the infectious organism (or other cause) is an important part of modern treatment of pneumonia. The anatomical patterns of distribution can be associated with certain organisms, and can help in selection of an antibiotic while waiting for the pathogen to be cultured. ↑ Cotran, Ramzi S.; Kumar, Vinay; Fausto, Nelson; Nelso Fausto; Robbins, Stanley L.; Abbas, Abul K. (2005). Robbins and Cotran pathologic basis of disease. St. Louis, Mo: Elsevier Saunders. p. 749. ISBN 0-7216-0187-1. 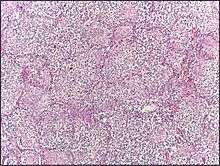 ↑ "Lobar Pneumonia". Retrieved 2008-11-16.